I hadn't read any reviews previous to buying these, so I wasn't sure what to expect but it also meant that I was going in with a completely open mind. First impressions I love the packaging, they look super sleek and way more luxurious than the price I payed for them. But of course it's what inside the packaging that counts and I have to say that I have a love/hate relationship with these. I love how opaque they are, like seriously one swipe of colour is more than enough. I also love how they apply on the lips, super smooth and you have time to apply the colour evenly before they dry, because these are not glossy in any way, they are completely matte. Now even though I love that they don't dry straight away, it's also one of the things I hate because I find that they take too long to dry (I'm talking over 5 minutes of not being able to touch your lips together because if you do the lipstick will stick together). Is it just me that's too impatient? Maybe but I would much prefer if the drying time was reduced by half at least. 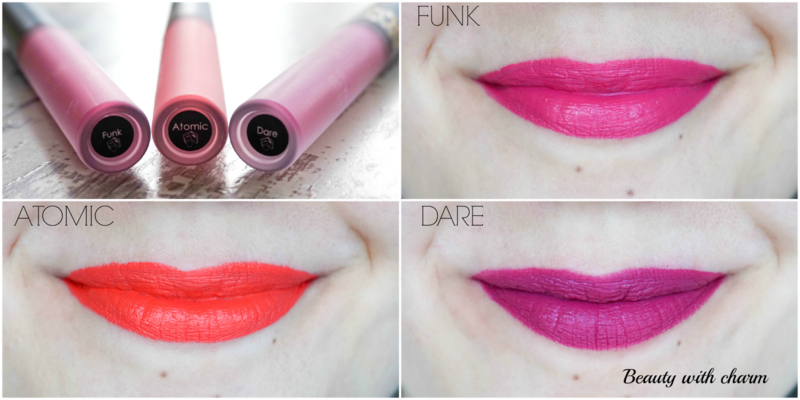 Funk is pictured immediately after application (glossy), Atomic is pictured after about 2 mins of application (semi-matte) and Dare is pictured after about 6 mins of application (matte). Once they are dry these don't budge until you start eating (especially if you are eating oily foods, etc) which is my favourite thing about these lipsticks. Because of this and the matte formula these are not exactly moisturising, in fact they can feel quite drying on the lips but no where near as drying as I had expected them to be. 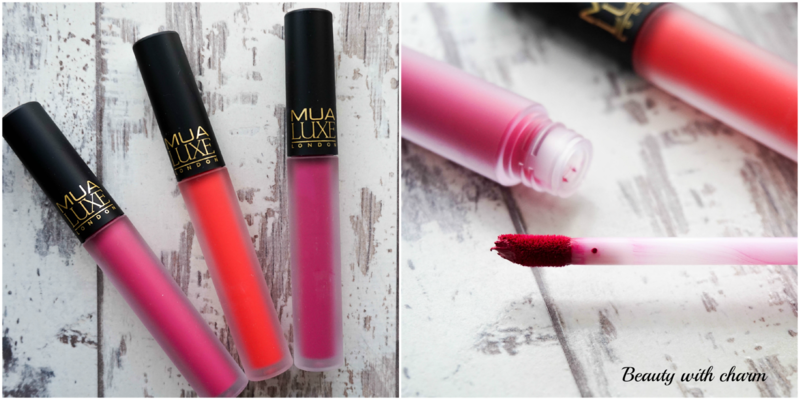 I just make sure that my lips are in the best condition they can be before wearing these to minimise them further drying out my lips. Another thing I don't like is the fact that once you do start eating, etc the formula just kind of starts crumbling off your lips (if that makes sense), which makes it impossible to re-apply over what is left on your lips so you have to completely remove the remaining lipsticks and start fresh. 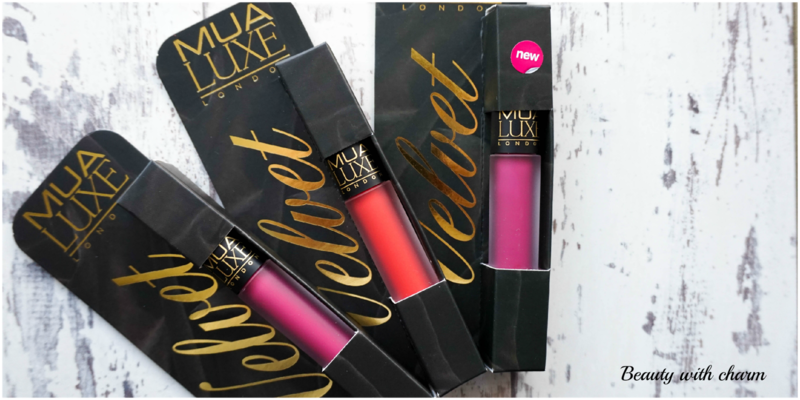 I know I have mixed feelings about these and there's definitely things I love and things that bug me in terms of formula but for £3 if you are looking for a liquid lipstick these are worth trying out. I've actually found a great way of wearing these to make it work for me personally; instead of using the wand I just dab the lipstick using my finger. This way the drying time is minimised and they don't crumble off when I start eating, it also means the colour is not as pigmented but I don't mind as I mostly wear these during the day anyway.